Wilfrid Laurier University is welcoming a new class of first-year students to its Waterloo and Brantford campus communities with a series of orientation events taking place Sept. 3-9. The Wilfrid Laurier University Students’ Union has organized an Orientation Week schedule that highlights the strengths of Laurier’s inclusive community. Orientation Week will focus on helping first-year students balance elements of student life while achieving academic success, enjoying life in the cities of Waterloo and Brantford, and understanding the importance of Laurier’s student body in our communities. Key programming initiatives for Orientation Week include sessions covering consent and gendered violence prevention, physical and mental wellness with an emphasis on student safety and support. All first-year students, whether registered for Orientation Week or not, will attend Succeeding at University sessions Sept. 5 for tips and advice from faculty champions on a successful and positive start to university. An International Orientation for Laurier’s new international students will take place Sept. 1-9. The Office of Student Affairs, the Faculty of Graduate and Postdoctoral Studies and the Graduate Students’ Association, in partnership with academic programs and departments, will be hosting Graduate Student Orientation events on Sept. 6. The Laurier Students Public Interest Research Group will run Radical Orientation Week Sept. 11-15 to provide resources and introduce students to organizations doing social justice work at Laurier. Events include exploring myths around Indigenous Nations, sexual health including LGBTQ2s+ perspectives, queer and trans orientation, a participatory art project for gendered or sexual assault survivors to share their stories, and more. Laurier will again host a demonstration about the importance of fire safety, presented by Waterloo Fire Rescue (WFR) at Laurier’s Northdale Campus on Sept. 5 and by the Brantford Fire Department Sept. 6 behind Post House Residence. At demonstrations on both campuses, firefighters will ignite and suppress fire in a single room to demonstrate the importance of smoke alarms, how quickly fire can spread and the importance of having an evacuation plan. On the Waterloo campus, a kitchen fire demonstration will show the effect of putting water on a grease fire and how to properly extinguish it. On Sept. 6 in Waterloo and Brantford, author and co-founder of the Date Safe Project Inc. Mike Domitrz will present ‘Can I Kiss You?’ This interactive presentation brings a unique approach to tackling important topics such as dating, intimacy, consent, how to be an active bystander and sexual assault. 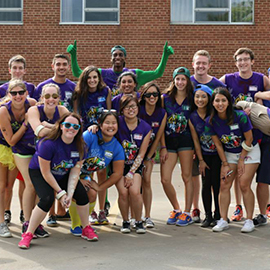 On Sept. 9, first-year students will participate in Shine Day throughout Kitchener, Waterloo, Cambridge and Brantford. Continuing a tradition that started at Laurier more than 50 years ago, students will wash cars, shine shoes and run barbecues to raise money for Shinerama, which helps fund cystic fibrosis research and treatment. New to the Waterloo campus this year, the Positive Pulse event on Sept. 5 will focus on student wellness and mental health. The event incorporates physical activities such as yoga and Zumba, and gives students the chance to ask tough questions about transition and change. Facilitated by educational programming company Disruptt, students can anonymously submit any fears they have about coming to university, which are addressed through thought-provoking questions and responses. On Sept. 7 in Waterloo, students will meet fellow first-year students from other schools at WaterlooFest in Waterloo Public Square. Organized in partnership with the City of Waterloo, the University of Waterloo and Laurier, the event includes live performances and food trucks and allows students to meet city officials and each other while getting to know their city. Read Laurier’s Waterloo campus orientation news release or visit the Waterloo campus O-week schedule. A perennial favourite of O-week at the Brantford campus, the Mayor’s Lunch will be back again on Sept. 6 with municipal officials serving up lunch to first-year students at Harmony Square to officially welcome them to Brantford. Read Laurier’s Brantford campus orientation news release or visit the Brantford campus O-week schedule.